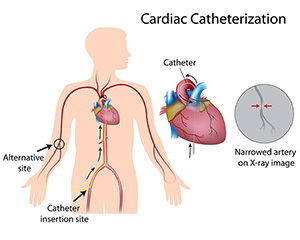 Cardiac catheterization is a diagnostic procedure performed by a cardiologist to evaluate certain types of heart disease. A thin plastic tube (called a catheter) is inserted into a blood vessel, usually in the leg but sometimes in the arm. The catheter is advanced through the blood vessel to the heart where pressures can be measured. Dye is injected through the catheter to allow the cardiologist to visualize the coronary (heart) arteries and structure of the heart. This is called angiography. The procedure typically takes less than an hour, but may take up to two hours if angioplasty needs to be performed to open a blockage. Coronary angioplasty is a non-surgical procedure that involves advancing a balloon through a catheter into a particular heart artery where a blockage exists. The balloon is inflated to compress the blockage and open the artery. A stent is a small steel spring delivered with an angioplasty balloon that is left in the artery to keep it open. Do not eat, drink, or smoke for several hours before the test. If your test is in the morning, begin your fast after midnight the night before. If your test is in the afternoon, you may have a light liquid breakfast such as fruit juice or tea. Take your usual medications, especially aspirin, with a small amount of water the morning of the procedure. If you are allergic to aspirin, please talk to your doctor about Plavix as an alternative. If you take medication for diabetes, do not take the medication before your procedure unless instructed to do so by your cardiologist. Local anesthesia will be administered over the artery where the catheterization is to be performed. The local anesthetic may cause a slight sting or burning sensation that lasts only a few seconds. A small puncture is made in the artery and a sheath (plastic tube) is inserted. The catheter is then painlessly advanced through the sheath to the heart arteries for dye injections, x-ray pictures, and pressure measurements. You may experience a flushing feeling with these injections but should feel no pain. If the catheterization shows blockages within your coronary arteries, your cardiologist may choose to open these blockages through the catheter. This process is called coronary angioplasty and may involve placement of a stent. Angioplasty with or without stent implantation involves advancing a non-inflated balloon or stent though a catheter and down the artery to the exact location of your blockage, where it is inflated, compressing the blockage against the wall of the artery. When the balloon or stent is inflated, blood flow to your heart is temporarily interrupted and you may experience a brief period of discomfort. Every effort will be made to minimize this discomfort. A member of the team applies hand pressure from 5 to 30 minutes. This may be followed by placement of a sandbag on the groin to maintain some pressure over the entry site to prevent later bleeding. Patients are usually required to remain in bed from 5 to 8 hours. A closure device is inserted into the puncture site by the cardiologist in the catheterization laboratory. This allows you to get out of bed earlier and may not require a sandbag. Though more convenient for the patient while in the hospital, the use of this device requires some special care at home. A small lump may persist at the catheterization site for up to a month. The doctor will come into your room to discuss the findings with you and, if you wish, your family members. You will be told whether further therapy is necessary. Further therapy may involve additional medications or even cardiac surgery. If surgery is recommended, it is usually scheduled for another day. When you return you can expect to see a bruise or lump develop at the puncture site and remain for a week or more. This is normal. If there is extensive bruising, some discoloration and tenderness may last for several weeks. You should notify your doctor if you have new bleeding, increasing tenderness, redness or drainage from the puncture site, fever, chills or change in color or feeling in the limb used during the catheterization. If a closure device was used, a plastic covering will be left over the site. This covering should be replaced daily after showering for the first three days. For the next four days, this site should be cleaned daily with a mild soap and covered with a clean band-aid. You can shower but not bathe for this period of time. If you had an elective catheterization without angioplasty, you should expect to take the day off after the procedure. If you have special needs, please discuss them with the doctors or nurses before you go home. If you had an angioplasty or stent placement, you must clarify with your doctor when he/she has released you to return to work. Also, ask the physician when you can resume exercising.